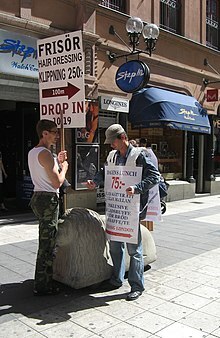 Two human billboards in Stockholm, one holding a placard and the other wearing a sandwich board. A human billboard is someone who applies an advertisement on his or her person. Most commonly, this means holding or wearing a sign of some sort, but also may include wearing advertising as clothing or in extreme cases, having advertising tattooed on the body. Sign holders are known as human directionals in the advertising industry, or colloquially as sign walkers, sign wavers, sign twirlers or (in British territories) sandwich men. Frequently, they will spin or dance or wear costumes with the promotional sign in order to attract attention. An artistic depiction of human billboards in 19th century London, by George Scharf.